It is no secret that the world’s oceans are swimming with plastic debris — the first floating masses of trash were discovered in the 1990s. But researchers are starting to get a better sense of the size and scope of the problem. A study published Wednesday in the journal PLOS One estimated that 5.25 trillion pieces of plastic, large and small, weighing 269,000 tons, could be found throughout the world’s oceans, even in the most remote reaches. The ships conducting the research traveled the seas collecting small bits of plastic with nets and estimated worldwide figures from their samples using computer models. The largest source of plastic by weight comes from discarded fishing nets and buoys, said Marcus Eriksen, the leader of the effort and co-founder of the 5 Gyres Institute, a nonprofit group that combines scientific research with antipollution activism. Dr. Eriksen suggested that an international program that paid fishing vessels for reclaimed nets could help address that issue. But that would do nothing to solve the problem of bottles, toothbrushes, bags, toys and other debris that float across the seas and gather at “gyres” where currents converge. The pieces of garbage collide against one another because of the currents and wave action, and sunlight makes them brittle, turning these floating junkyards into “shredders,” he said, producing smaller and smaller bits of plastic that spread far and wide. When the survey teams looked for plastics floating in the water that were the size of grains of sand, however, they were surprised to find far fewer samples than expected — one-hundredth as many particles as their models predicted. That, Dr. Eriksen said, suggests that the smaller bits may be swept deeper into the sea or consumed by marine organisms. The result echoed that of a paper published this year in Proceedings of the National Academy of Sciences that found a surprisingly low amount of small plastic debris. Those researchers estimated as much as 35,000 tons of the smaller debris were spread across the world’s oceans, but they had expected to find millions of tons. The fact that the small plastics are disappearing is hardly good news. In fact, it could be far more troubling than the unsightly mess the plastics cause. Plastics attract and become coated with toxic substances like PCBs and other pollutants. Researchers are concerned that fish and other organisms that consume the plastics could reabsorb the toxic substances and pass them along to other predators when they are eaten. The ocean studies make an important contribution to the understanding of the floating waste problem, said Nancy Wallace, director of the marine debris program for the National Oceanic and Atmospheric Administration. Dr. Eriksen said the scope of the problem makes floating garbage collection impractical. His group has had some success with campaigns to get manufacturers of health and beauty aids to stop using small scrubbing beads of plastic in their products. 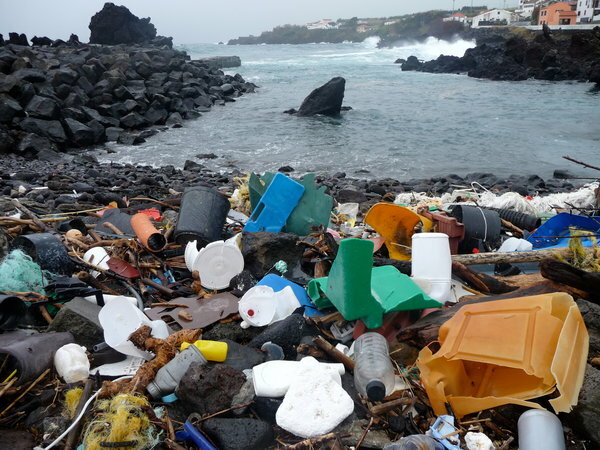 The American Chemistry Council, which speaks for the plastics industries, issued a statement saying that its members “wholeheartedly agree that littered plastics of any kind do not belong in the marine environment,” and it cited industry efforts to combat the problem, including the 2011 Declaration of the Global Plastics Associations for Solutions on Marine Litter, which has led to 185 projects around the world.